Scaling down optomechanical resonators to nanoscale dimensions enhances the coupling strength and integrates mechanical resonances with ultrahigh frequencies. This allows exploiting the interaction to manipulate optical and electronic signals at GHz operating frequencies. Moreover, the low mass of nanoscale resonators makes them very sensitive to external influences as well as actuating forces, providing a route to new sensor technology. Extreme optomechanical interactions are possible in suitably engineered systems that control both light and motion at the smallest possible scale. An example are the sliced photonic crystal nanobeams developed by AMOLF. These exploit the confinement of light at a scale smaller than its wavelength to simultaneously allow record-large optomechanical coupling strengths and high optical and mechanical coherence. These traits are combined in a characterizing parameter called single-photon cooperativity, which reaches ~1000 in these systems. It is so large that the intrinsic nonlinearity of the optomechanical interaction is revealed. This effect allows efficient nonlinear measurements of the motion of the resonator – a principle that can be exploited to measure the energy of nanomechanical sensors, potentially down to the quantum level. AMOLF studies how such extreme optomechanical coupling strengths can be exploited to create novel sensors that operate with practical optical bandwidths, suitable to integrate in small devices. CNRS, Thales, and Ghent University exploit nanoscale optomechanical systems to achieve high-spectral purity frequency synthesis for microwave applications (advanced communications, radar, electronic warfare/intelligence systems) and RF filtering. Current microwave clocks, such as Voltage Controlled Oscillators and quartz oscillators, suffer from two main drawbacks: frequency synthesis is not performed directly at the frequency of interest, in the GHz domain, and systems remain too bulky for embarked applications. 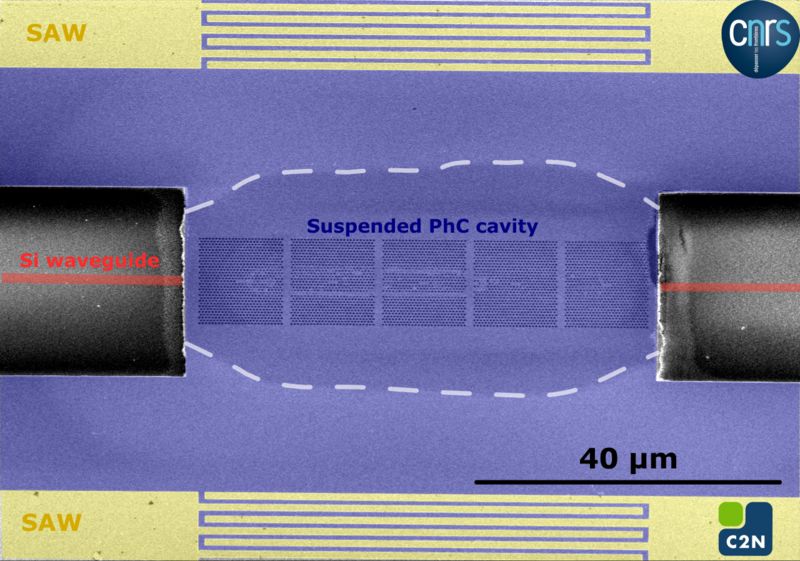 CNRS & THALES tackle both challenges by (i) achieving high-spectral purity frequency synthesis directly in the GHz domain (ii) directly in a miniaturized photonic chip device. Size reduction of the oscillator and direct high-frequency generation will exploit a nano-optomechanical resonator within an on-chip electronic loop, insuring high stability of the oscillation frequency in the GHz frequency range. These resonators are implemented with a disruptive architecture relying on value-added 3D heterogeneous integration. They consist in suspended piezo-electric semiconductor membranes pierced by photonic crystals which simultaneously sustain optical modes around 1.55 μm and mechanical modes around a few GHz. 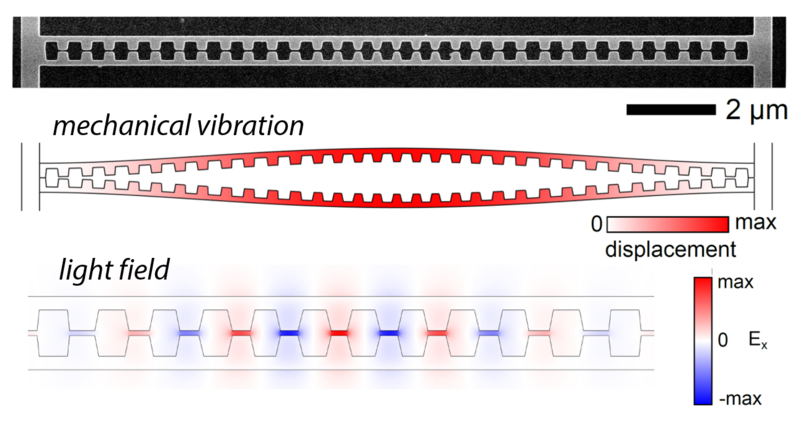 A silicon waveguide is integrated underneath the membrane, allowing for an optical control of mechanical resonances; Surface acoustic wave (SAW) transducers formed by interdigitated electrodes are deposited on top of the piezo-electric membrane, enabling generation and control of coherent mechanical vibrations in the GHz regime. These two integrated control tools will be used to build on-chip stabilization loops, with the aim to directly synthesize microwaves at GHz frequencies.